It is the disorder of language associated with many errors in speech and the person may show many verbal repetition also short term memory loss. Naming difficulties may also occur. It is also known as associative aphasia. Conduction aphasia is the type of aphasia. Patient may speak words or sentences with speed. Patient may hear properly and can understand every word and sentence but can have problems during speech. A disruption in this arcuate asciculus will not allow the signals to transfer between these two areas of language concerned and as a result the person experience problems in speech and repetition of words along with complex conversations. The speech of patient is also effected When Damage in the area of cortex occur. Any kind of damage and obstruction to arcuate asciculus can lead to conduction aphasia. As it connects the two areas concerned with the speech and language. If the signals are not sent to the other side then the person will suffer from conduction aphasia. Any kind of damage to the parietal lobe located in the brain can also cause conduction aphasia. If any lesion occurs in any of the area associated with the language and speech i.e. 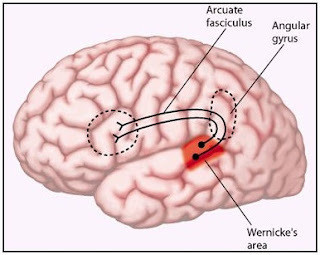 Broca’s area and Wernicke’s area then it can affect the speech of person and can cause conduction aphasia in that person. • The person speaks Speedily. • The patient speak some words repetitively. • Disappointment faced by patient. • Repeatedly correction of words spoken by the person during conversation. • The person suffering from conduction aphasia can’t hold his language. • The person suffering from conduction aphasia don’t feel comfortable in between gathering. All symptoms associated with aphasia last for only several hours and then disappear. The treatment of aphasia involves many techniques like improving the persons’ language with continuous and repetitive practice of speech with confidence. The patient is encouraged to speak confidently and some communication episodes are also held between patient and any normal person to improve the patient’s communication. Regular exercises are held for the sake of patient’s improvement. The improvement occurs slowly, day by day, not sudden. Regular therapy is required for the patient to fully recover. Conduction aphasia is mild in action but occurs abundantly in different patients with different causes. After these verbal therapies the patient feels relax.